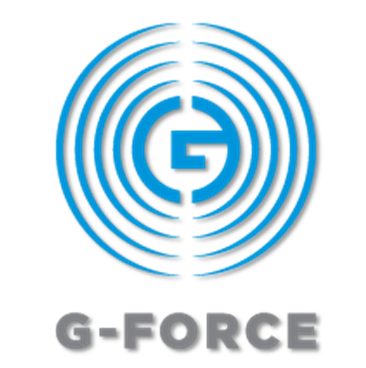 Tweaking Omnia.11 G-Force presets - Broadcast Audio Processing World! 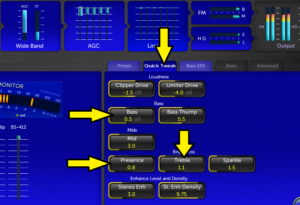 In general, I design presets to have some sort of a “middle ground” sound. Not too much high or low end, and not too little. Exactly what that means is highly subjective. 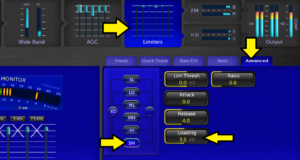 With the above in mind, there are several options to allow end users to tailor the sound of a preset to their tastes, or to the tastes of the market they are in. These suggestions apply only to the G-Force (blue design screen) versions of the Omnia.11, not the “Orange Screen” design version! 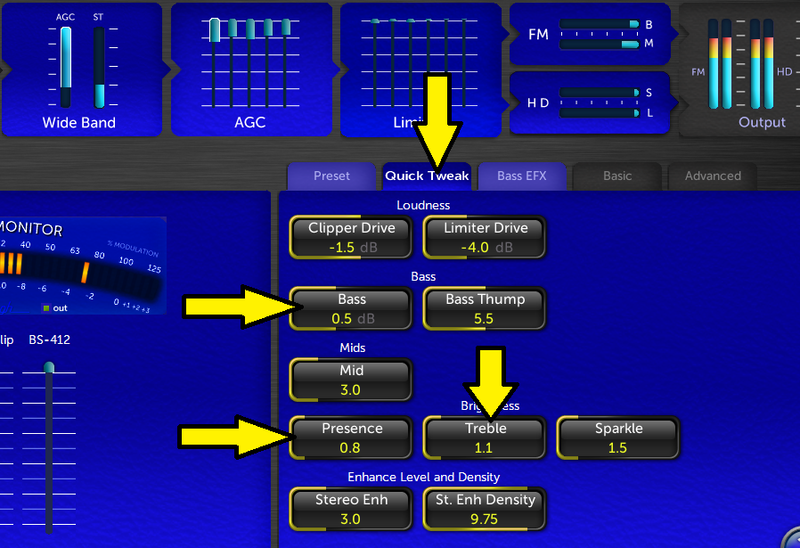 tab, and adjust the Bass / Presence / Treble controls. The “presence” control (as a reference) adjusts the “electric guitar” range of frequencies (around 2 kHz). 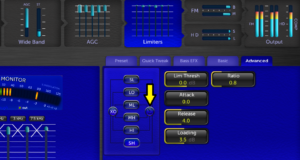 The “Mid” control is useful to dial in warm midrange frequencies. Think of the frequencies you hear resonating back at you when talking into (or listening through) a large cardboard box. By default, I like dynamically natural high end. That is, the highs can be louder (if this is the way they are recorded). Some do not like this sound. They want more “controlled” high end. That is, the highs must be contained – otherwise some perceive them to be “sibilant”. 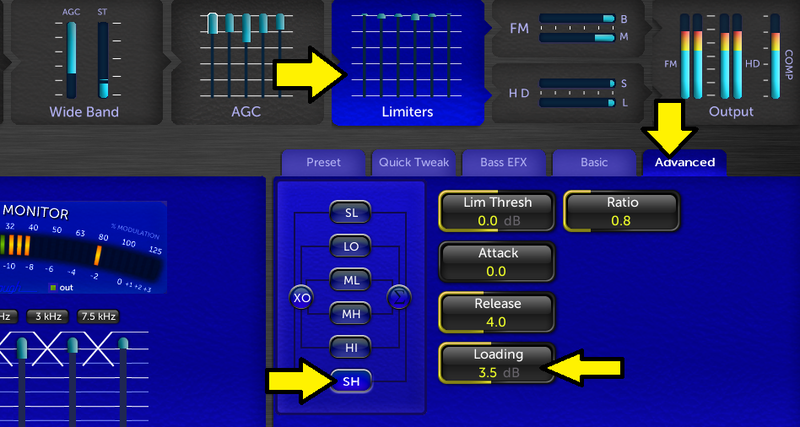 The “Loading” control adjusts how “thick” a dynamic limiter band will sound. Turn up the loading control to around 3.5 to 4.5. This will “compress” the super high band more to “unify” the sound of extreme highs. 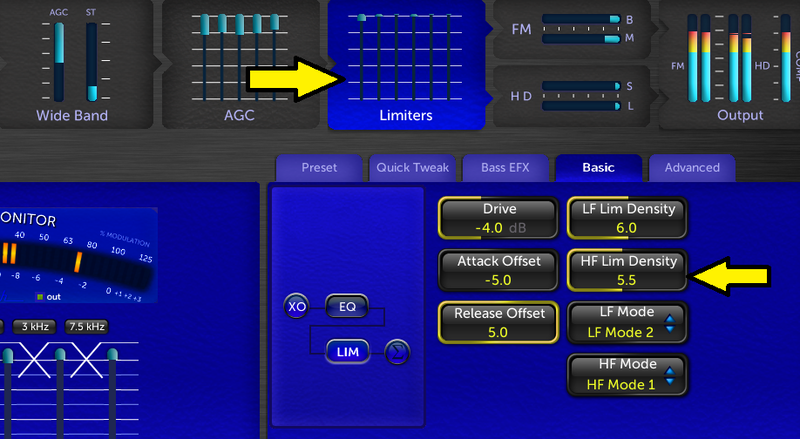 Next, go to the “HI” band limiter, and increase its Loading control to roughly ½ of the SH loading. 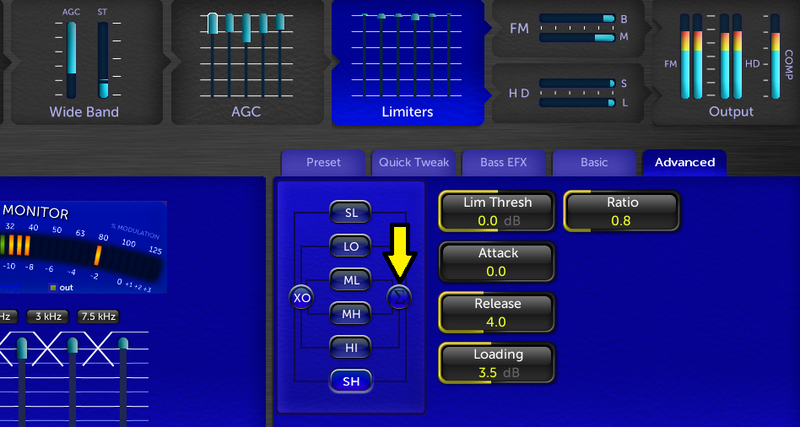 Click on the “sigma” or “summing” button to bring up the mixer bands. The “sigma” button brings up the mixers page. From here, decrease the SH Mix and Hi Mix to taste. Adjust for proper HF Balance. 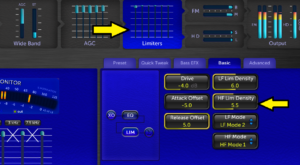 Click on the dynamic “Limiters” icon again and adjust the “HF Lim Density” control to give the final touch to the high-end signature of the modified preset. Higher density settings add more “thickening” to the high end. Lower settings give a more “subdued” tone to the high end. Density Controls give the final touch on audio texture. Hopefully, this will not only give you a sound close to your market desires, but I hope you have gained some additional insight to allow you to play around and create your own signature sound!